World Snowsports Events Group, Blue Mountain Resort and Big Brothers Big Sisters of the Georgian Triangle combined forces on World Snow Day to provide a unique opportunity for local children to experience a day of skiing and snowboarding with their Big Brothers and Big Sisters at Blue Mountain. World Snowsports Events Group, organizers of the Audi FIS Ski Cross World Cup, presented by Rockstar and LG FIS Snowboard Cross World Cup, presented by Rockstar held at Blue Mountain February 1-8, 2012, organized the ski/snowboard day which included a media event to kick-off the World Cup program. 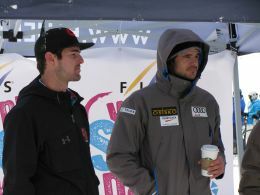 The FIS World Cup events held at Blue Mountain included a variety of community initiatives to promote active living and healthy lifestyles through snowsports. Coverage of the event appeared on local media outlets including: CTV Barrie, The Enterprise-Bulletin, The Connection/Simcoe.com, Bayshore Broadcasting, The Peak 95.1 FM, and mycollingwood.ca. On January 22, 50 participants from Big Brothers Big Sisters of the Georgian Triangle were able to Explore, Enjoy and Experience a great day on the snow at Blue Mountain Resort and meet two of the Canadian National Team athletes – Jake Holden from the Canadian Snowboard Team and Nic Zoricic from the Canadian Ski Cross Team. Jake and Nic had lunch with the kids, posed for photos and signed autographs and helped inspire the kids to get out and have fun in the snow. One of our partners, Mountain Equipment Co-op (Barrie, ON) graciously donated 2 pairs of snowshoes, which were given to the Big Brothers Big Sisters of the Georgian Triangle so that the “Bigs and Littles” would have more opportunities to get out and enjoy the snow in the future. 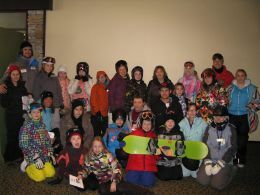 All the participants left with a Columbia backpack full of goodies, courtesy of World Snowsports Events Group, and rosy cheeks courtesy of Mother Nature and the snow-filled day at Blue Mountain. 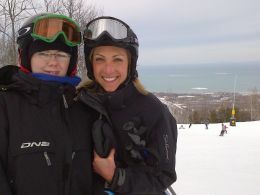 Little Sister Sierra with Big Sister Suzanne at Blue Mountain on World Snow Day, (with Georgian Bay in the background).